Despite spending billions of dollars every year on security, companies and governments – as well as the products and services they use – often lose sight of their ultimate goal: protecting the user. 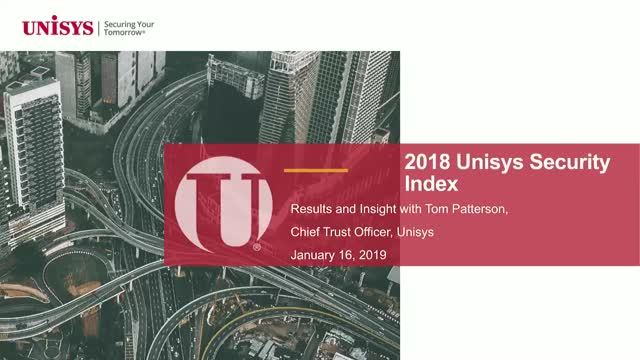 Please join this webinar to hear Tom Patterson, the Chief Trust Officer for Unisys, share results and realities from the only recurring snapshot of consumer security concerns conducted globally. This year’s global Unisys Security Index survey brings to light key areas of consumer concern that are vital to understand, if society and the security sector are to be successful in achieving their goals. Major findings affecting government services, entire business sectors and fast evolving technologies are all illuminated through the lens of the user, as opposed to the more typical providers. Learn what’s most important to the consumer in each region of the world, and across key demographic categories. This clarity of vision, brought by thousands of statistically significant consumers from around the world, is a voice that needs to be heard. Tom will use this year’s results, juxtaposed with over a decade of survey history and informed by global events and leaders from both government and industry, to provide a cogent report on the state of global security from the perspective that matters most—the user. Unisys Security Index es una importante encuesta regular de las preocupaciones de seguridad llevada a cabo en todo el mundo. Lanzada a nivel mundial desde 2007, proporciona una medida regular y estadísticamente sólida de las preocupaciones que tienen los consumidores de 13 países con respecto a los principales aspectos de la seguridad, incluyendo seguridad nacional, financiera, personal y ciber seguridad. Únase a este webinar para escuchar a Leonardo Carissimi, director de Ciberseguridad para Unisys América Latina, compartir los resultados y realidades de la encuesta sobre de las preocupaciones de seguridad de los consumidores en Argentina, Colombia y México. Leonardo usará los resultados de este año, yuxtapuestos con más de una década de historial de encuestas realizadas para proporcionar un informe convincente sobre el estado de la seguridad desde la perspectiva que más importa: la del usuario. Unisys Security Index é uma importante pesquisa sobre preocupações de segurança realizadas em todo o mundo. Lançado globalmente em 2007, fornece uma medida regular e estatisticamente sólida das preocupações que os consumidores em 13 países têm sobre os principais aspectos da segurança, incluindo segurança nacional, financeira, pessoal e cibernética. Participe deste webinar para ouvir Leonardo Carissimi, diretor de Segurança Cibernética da Unisys América Latina, compartilhar os resultados e fatos da pesquisa sobre as preocupações de segurança dos consumidores do Brasil. Leonardo usará os resultados deste ano, justapostos com mais de uma década de histórico de pesquisas para fornecer um relatório convincente sobre o estado de segurança da perspectiva que mais importa: o usuário. A recent warning issued to banks by the FBI reads like the script for a Hollywood movie: cybercriminals are plotting a sophisticated, global “ATM cash-out” using cloned credit cards to fraudulently withdraw millions of dollars in just a few hours. A few days later, reports of a $13.5 million heist of 25 ATMs across the globe confirmed the reality that ATMs are a prime target for hackers. Are you prepared for when an ATM breach occurs, or more importantly, when a hacker gains access to your network and confidential customer information through your ATM networks? Network segmentation is one of the must-have strategies to limit the scope, cost and complexity of compliance. The challenge in segmenting a network with static controls such as firewalls, VLANs, etc is the complexity of management and change. Access Control Lists (ACLs) and firewall rules can easily run into thousands of rules that have to be manually reconfigured every time there is a new application to be rolled out, or changes are introduced in regulations. The result is increased cost and complexity - the very challenge that you were trying to solve. In this webcast, Unisys cybersecurity experts will introduce you to a new software-defined network microsegmentation that enables dynamic perimeters to isolate the critical assets without the cost and complexity of static controls. This approach reduces attack surface while also reducing audit scope, cost and management complexity. Microsegmentation is not segmentation. Segmentation is done for network optimization and performance, and should not be confused or conflated with security. Microsegmentation is a security concept first and foremost. Unisys experts will elaborate on microsegmentation concepts with particular emphasis on its use in support of compliance issues. They will then take you through illustrative examples of isolating and securing systems in the context of HIPAA, HITECH and PCI-DSS regulations. * Know the different types of network segmentation and their role - primary, secondary and microsegmentation, etc. You need a new, preemptive approach to security that creates a perimeter less network that is resilient and survivable. This approach requires you to identify assets critical to your continued operations and making them accessible to only protected communities of trusted users. It requires risk management through the implementation of policies and controls that are translatable across organizational silos each with competing tactical objectives. Finally, the new approach must scale to support dynamic and transformative IT needs, regardless the size of the organization. - Understand the failures of the bolt-on security approach. - Get an overview of the tools required to align threat response with business objectives. - A live demo of Stealth Microsegmentation. The historical approach to business security has focused on defending a fixed perimeter. The objective was to keep threats on the outside of the perimeter like a wall around a castle. However, today the reality is that these same boundaries are harder to define and very porous. The assumption that systems and traffic within a data center can be trusted if flawed because once a single host is compromised, moving within a trusted zone is often easy. While it is often hard to directly attack high-value assets from outside the network, using an indirect attack using systems inside the network is much simpler, although more time-consuming. The Zero Trust architecture is an ideal solution for the cloud where it is not possible to trust the network. The ability to authenticate and secure communication without relying on the location of the endpoints or the security of the network means that our clients can adopt the cloud paradigm and embrace its benefits of cost and flexibility while maintaining control of their data and compliance in virtual environments. - Examine the fundamental benefits and tenants of the zero-trust model in the cloud (security persistence, security ubiquity and scalability). - Understand how this new paradigm accelerates the cloud adoption. Consumers are enjoying a rapidly expanding choice of how, when and where they bank. However, banks must now manage the extra responsibilities and risks these new channels bring. In APAC, the Unisys Security Index™ revealed consumers are more concerned about bankcard fraud, ID theft and cyber security than about physical threats like the threat of war/terrorism and natural disasters. So how can banks balance the need to digitally transform, maintain privacy and security but still provide a seamless, personalized and trustworthy customer experience?  The 10 steps banks need to take to get digital transformation right, and how to improve customer experience and trust during this journey.  How the CISO’s office can be part of the digital transformation journey, embedding security as part of the development lifecycle from the start as a value added component and not a burden as an afterthought.  Innovative technologies like predictive analytics and biometrics can help provide a seamless, frictionless experience for customers. But how can they be applied without seeming invasive? Nicholle is an experienced senior financial services executive with almost 20 yrs experience working in financial institutions and corporates. She has extensive knowledge across financial services, payments, consumer and business banking, IT, analytics, marketing and strategy. Leon Manson, Lead Cybersecurity Architect for Unisys APAC, is responsible for the range of real-time protection solutions delivered through Unisys Managed Security Services. Leon has over 25 years IT security industry experience in consulting and systems engineering for startups, tier-one vendors, and as a business owner. Ian Selbie is responsible for Unisys Financial Industry solutions in APAC focused on enhancing business processes and compliance in financial institutions including omnichannel, financial crime prevention, enterprise payments and case management solutions. Unisys advises banks, non-bank lenders, insurers, and payments providers developing data management and artificial intelligence capabilities. This webinar will showcase client examples applying machine learning and predictive analytics to optimize consumer engagement, identify fraud and cyber security risks, and bring new capabilities to credit modeling. Rodrigo Fontecilla is vice president and global lead for analytics for Unisys Federal Systems, where he leads all aspects of software development, system integration, mobile development, and data management focused on the federal government. Rod is responsible for providing leadership, coordination, and oversight on all IT solutions, emerging technologies, and IT services delivery to the federal government. He has more than 25 years of professional experience in the capture, design, development, implementation, and management of information management systems delivering mission-critical IT solutions and has an extensive background and expertise in cloud computing, mobile development, social media, enterprise architecture, data analytics, SOA-based solutions, and IT governance. Maria L. Allen is Senior Director and Global Head of Unisys' Financial Services Portfolio Solutions. In this role, Maria is responsible for building new products and services across all regions, platforms and channels ensuring that solutions and services are delivered in a way that enable our clients to meet their strategic goals and objectives. It's time for a new approach. In an environment of complex multi-variant threats, targeted attacks on personally identifiable information and regulatory penalties that have the potential of bringing a business down, assumption of compromise is the norm. In fact, security professionals who must balance the delivery of productivity enhancing IT innovation with the requirement to maintain a solid security posture, have found a new approach. Join us on this webinar to learn how having immediate visibility into the critical engagements between your organization's assets, and being able to isolate the critical, will allow your organization to be resilient against attacks. Erin is the Director of Product Management for Unisys Stealth software. Erin has worked in the security product management space for years, focusing on cloud, mobile and on-premise security solutions. Prior to that Erin managed products in the Windows server and mainframe spaces. Chip is the Sr. Product Manager for Unisys Stealth software. He is an experienced security technologist with a background in systems programming and security software. In his current role, Chip is dedicated to working with Unisys clients to demonstrate practical micro-segmentation, and how to implement within each client’s custom environment. Saiba mais sobre as preocupações dos seus consumidores! O Unisys Security Index mede as preocupações dos consumidores em questões relacionadas à segurança nacional, pessoal, financeira e da Internet. O Unisys Security Index mostrou um aumento de 20% na preocupação de segurança geral em 2017. Saiba mais neste webinar onde iremos apresentar os detalhes do estudo e falar sobre como lidar com ameaças cibernéticas, o que os consumidores pensam sobre Internet das Coisas, e como aumentar a confiança de seus consumidores enquanto sua empresa avança na Transformação Digital. Leonardo Carissimi, Especialista em Segurança e Diretor de Soluções de Cybersecurity para América Latina da Unisys. Possui mais de 20 anos de experiência no setor de segurança. Na Unisys, ajuda a construir um mundo mais seguro, ao mesmo tempo em que transforma o setor de segurança com uma inovadora abordagem de microssegmentação, bem como a arquitetura de segurança adaptativa e a inteligência de ameaças cibernéticas. ¡Conozca las preocupaciones de sus clientes y actúe! El Unisys Security Index mide las preocupaciones de los consumidores en problemas relacionados a la seguridad nacional, personal, financiera y en Internet. El Índice Global de Seguridad mostró en 2017 un aumento de 20% en la preocupación general de seguridad. Aprenda más en este webinar sobre los detalles del estudio, cómo hacer frente a ciber amenazas, qué opinan los consumidores sobre el Internet of Things, y gánese la confianza de sus consumidores mientras continúa su proceso de Transformación Digital. Leonardo Carissimi, Experto en Seguridad y Director de Soluciones de Seguridad en América Latina de Unisys. Cuenta con más de 20 años de experiencia en la industria de seguridad. En Unisys, ayuda a construir un mundo más seguro mientras transforma la industria de seguridad con el innovador enfoque de micro-segmentación, así como con la Arquitectura de Seguridad Adaptativa y la Inteligencia de Ciber-Amenazas. Digital disruption in the banking arena is accelerating. Pure digital firms have raised the bar for customer expectations regarding convenience, service, and speed. Fintech companies are taking over profitable areas such as payments, lending, and retail investments. In this new world, banks need to create a seamless, personalized customer journey. This journey must be marked by intuitively grasping and fulfilling the customer’s next demand. But how do banks create this sought-after customer experience? The answer is found in building a cohesive ecosystem incorporating the perfect blend of both digital and physical touchpoints. Discover how to grow wallet and market share by making customer journeys easy and frictionless across all touchpoints. As you simplify the way customers interact with your bank, you will reduce costs and free up both staff and capital, which you can then apply to support further innovation and growth. Eric Crabtree is the global leader for Financial Services. In his current role, Eric is building a cohesive strategy for the financial services vertical, by leveraging the extensive domain expertise across the Unisys portfolio and ensuring that solutions and services are delivered in a way that enable our clients to meet their strategic goals and objectives. Daniel W. Latimore, CFA, is the Senior Vice President of Celent’s Banking group and is based in the firm’s Boston office. Mr. Latimore’s areas of focus include the banking ecosystem, digital and omnichannel banking, and innovation. Damage, counterfeit, theft, delays: these are some of the most pressing challenges that pharma supply chain executives are facing. Consequences are not limited to disruptions and to higher costs for manually managing exceptions, identify irregularities, and tracing products: there's also direct impact on patient safety, and customer satisfaction putting company reputation at risk. In this webinar IDC analysts will share its research findings and provide guidance to pharmaceutical executives that want to start harnessing the real value of third generation digital platform, and implement a consistent, efficient and future-ready approach to supply chain management. Silvia Piai is Senior Research Manager within IDC Health Insights for Europe Middle East and Africa. She is responsible for analyzing key trends related to IT strategies and spending in European healthcare organizations, and global Public Health institutions. She advises healthcare organizations and ICT vendors on planning and implementing effective digital health transformation initiatives to drive business innovation. Silvia’s analysis offers in-depth coverage of the technologies that provide the most clinical value in terms of quality, cost, time, and agility and are transforming pre-care, point of care (POC), and post-care today. Stefanie Naujoks is Senior Research Manager within IDC Manufacturing Insights, where she leads a new global program on Manufacturing Business Ecosystems Strategies. Her research includes managing supply networks, selling into new business ecosystems and manufacturing B2B Commerce, enabling better ecosystem collaboration through industry collaborative clouds, as well as automation and transparency within business ecosystems. Stefanie has published numerous market studies in the fields of digital transformation, IoT, Industry 4.0, Product Lifecycle Management (PLM), Manufacturing Execution Systems (MES) and Supply Chain Management (SCM). Always on, always operating and always critical, Industrial Control Systems (ICS) increasingly use public networks optimized for access, not security. As organizations merge traditional IT with Operational Technology (OT) networks to save cost of equipment and manpower, traditional approaches such as "air gap" are no longer sufficient. Often difficult to update, ICS environments are defenseless against common threats such as ransomware and DDoS attacks. Join this webinar with Mike Assante, SANS Director of Critical Infrastructure, and Unisys ICS industry security experts Chris Blask and Stuart Phillips, to learn how a micro-segmentation security strategy can help you modernize your ICS deployment without compromising security and privacy. U.S. consumers rate national security in relation to war or terrorism as their top security concern, though fears over viruses/malware and hacking are rising dramatically, according to the new Unisys Security Index™ that surveyed more than 13,000 consumers in April 2017 in 13 countries. This study, the only recurring snapshot of security concerns conducted globally, gauges the attitudes of consumers on a wide range of security-related issues. During his 21-year career as a Special Agent with the Federal Bureau of Investigation, Bill was recognized as an innovator who regularly sought new ways to use technology to solve complex problems. He is credited with leading numerous award winning IT initiatives, among them the FBI’s Grid Computing Initiative (Attorney General’s Award for Innovation) and the Next Generation Workstation (FBI Director’s Award). Prior to joining Unisys, Bill served as the Deputy Assistant Director of the FBI’s IT Infrastructure Division, where he was responsible for the engineering, development, deployment, and support of the FBI’s worldwide IT enterprise. A graduate of the United States Military Academy at West Point, Bill was commissioned as an officer in the U.S. Army where he commanded a Field Artillery battery. He went on to earn a Master of Science in Information Assurance from Norwich University and he is a Certified Information Systems Security Professional (CISSP). Connected medical devices are playing a fundamental role in transforming patient care quality and experience and healthcare providers efficiency. But as the number and the variety of devices grow within the organization, medical devices and the broader IoT ecosystem become more complex to manage, impacting patient safety, information security, compliance and financial performance. About the speaker: Silvia Piai is Senior Research Manager within IDC Health Insights for Europe Middle East and Africa. She is responsible for analyzing key trends related to IT strategies and spending in European healthcare organizations, and global Public Health institutions. She advises healthcare organizations and ICT vendors on planning and implementing effective digital health transformation initiatives to drive business innovation.